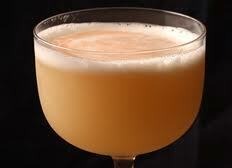 Rickhouse makes great mixed drinks, and none better than Our Finest Sour. The cinnamon that tops off the drink also gives it a nice aroma. So, what better drink to start off the Potrero Progressive Dinner than Our Finest Sour? Shake it all around. Add an ice cube, then top with egg white and another dusting of cinnamon for aromatic/visual flair. On making the egg white foam: It’s easiest to get a container of egg whites, instead of separating it from the yolk yourself. Generally, three tablespoons equals one egg. Pour the egg whites into a non-reactive bowl (e.g., Pyrex), and then use a whisk to beat it. Some people add a very tiny bit of salt at the beginning, which helps to firm up the proteins. After beating the egg whites for a bit, add a few drops of lemon juice (or cream of tartar) to stabilize the foam. When the foam reaches the desired firmness, use a spoon to scoop out some foam to top off your drink. This entry was posted in Drinks, Recipes and tagged Apple Brandy, Bitters, Bourbon, Egg White Foam, Our Finest Sour, Progressive Dinner, Rickhouse. Bookmark the permalink.